07:45 Hello everyone and welcome to AUTOSPORT Live for seventh round of the 2010 FIA Formula 1 world championship. The sport moves to the meeting point between Europe and Asia this weekend for the sixth Turkish Grand Prix at the 5.538 km Istanbul Park circuit. Red Bull arrived here earlier this week as the team to beat, following a superb string of qualifying and race performances, but yesterday's practice sessions proved once again that although the RB6 is fantastically quick, it still isn't 100 percent reliable - and the chasing pack will hope to capitalise on any frailty. The ever-challenging Turn 8 is ready and waiting to catch out any driver that doesn't have his set-up quite right, as Adrian Sutil found out to his cost with a sizable shunt on Friday morning. Final practice is just around the corner - the last chance for the teams to perfect their strategy for Sunday's 58-lap race. 07:46 Today, we will guide you through the final practice session with minute-by-minute commentary as the teams and drivers begin their build-up to qualifying. At 10:45 GMT, we will return for live coverage of the all-important qualifying session and the battle for pole position. AUTOSPORT Live will wrap up the day with a detailed race day forecast later this afternoon on the Turkish Grand Prix Weather page. 07:47 Two 90-minute sessions of free practice delivered the perfect case study into how methodical and thorough the teams are in their approach to testing new components and revised aero packages. For almost half of the morning session we saw the teams going through numerous installation runs to test out the functionality of F-ducts, collecting aerodynamic data with constant speed tests along the straights. Eventually the drivers put laps on the board, and McLaren started the day very well, topping the time sheet. Lewis Hamilton was quickest with a lap of 1m28.653s ahead of team-mate Jenson Button. Mercedes drivers Schumacher and Rosberg were third and fourth, with Sebastian Vettel fifth for Red Bull. 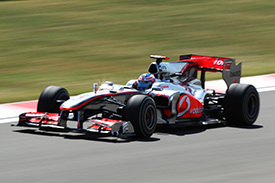 McLaren again ruled the roost in the afternoon, but this time Button was the man at the front. The top eight drivers were the same as we have seen in the races this season. Mark Webber led home Vettel for a Red Bull two-three, with Hamilton fourth. Fernando Alonso was fifth for Ferrari - celebrating its 800th world championship grand prix here this weekend - with Rosberg sixth, Schumacher seventh and this season's dark horse Robert Kubica rounding out the top eight. 07:49 This morning dawned much more cloudy and overcast than yesterday's forecast anticipated. There were even a few spots of rain in the air as a large swathe of cloud passed over Istanbul from west to east. Since then, the forecast has gone to plan. The clouds are dispersing to leave sunny spells and partial cloud cover. This trend will continue throughout the two track sessions today with lengthy sunny periods developing and a maximum air temperature of 29 degrees Celsius. We expect no rain for practice or qualifying this afternoon. 07:51 AUTOSPORT forum members are invited to join the fun throughout the weekend, offering thoughts and opinions as the event unfolds. • Red Bull fans, are you concerned by the continuing reliability issues that the team has, or will it all turn out okay during the race? • McLaren has typically shown good speed on Friday, but lost out on Saturday. 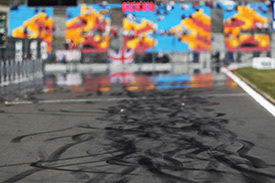 Can Hamilton and Button take the one-lap fight to the Red Bull drivers today? • Who would you like to see as the official Formula 1 tyre supplier next year? • To F-duct or not to F-duct? That was the question facing Red Bull engineers last night after evaluating the team's first version of the device on Friday. Ultimately, the decision was to remove the new parts without taking them in to the race, which will be welcome news in the chasing McLaren and Ferrari camps. 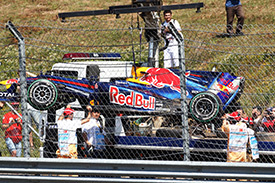 • Red Bull also confirmed that Mark Webber's engine did fail in the closing minutes of second practice, however this was a very old unit that had almost reached the end of its life. More worrying for the team were the repeated water pressure problems on Sebastian Vettel's car. • While Lotus was positive that its speed is moving ever-closer to the established midfield teams, Jarno Trulli was once again struggling for reliability after being sidelined with a gearbox fault in second practice. Team-mate Kovalainen was plagued by gearbox gremlins in Monaco, but yesterday set the fastest times of the new team runners. • Nico Hulkenberg also lost much of second practice to a hydraulic problem on his Williams. 07:55 Final practice gets underway at Istanbul Park in five minutes. 07:58 Under cloudy skies, the air temperature is 24 Celsius with the track at 26 degrees. 07:58 World champion Jenson Button is getting comfortable in his McLaren ahead of his first lap of the day. 08:00 Rubens Barrichello slots himself into the Williams ahead of action this morning. The mechanics strap him in. 0 min: Kovalainen in his Lotus leads the pack out on to installation laps. 0 min: Both Toro Rosso drivers leave the garage to join Chandhok and Liuzzi on the circuit. 1 min: Bruno Senna comes out and Nico Hulkenberg looks like he will leave the garage imminently. 1 min: Kovalainen is very slow on his lap and he reports gearbox problems to the Lotus team. 2 min: Kovalainen says he is stuck in third gear and he is slowly touring back to the Lotus pit. 3 min: Vettel, Sutil, Barrichello and Hulkenberg all come out onto the circuit for the standard installation lap. 3 min: Meanwhile, most of the drivers have now been out for a slow tour with Alonso and Button currently finishing off a lap. 3 min: Schumacher, Webber and Rosberg have yet to leave the garage. 4 min: Sutil is another driver touring very slowly around the circuit. 4 min: Sutil reports some problem with the car on the team radio. He is slowing still further into the pitlane. 5 min: Sutil free-wheels down the lane and is rescued by the Force India mechanics who jack the car up on a trolley. 6 min: Lewis Hamilton is the only man on track at the moment, completing an installation lap in the McLaren. 6 min: The Force India is now being pushed down the lane to the garage, where the mechanics will attend to the problem. 7 min: Hamilton returns to the pits, leaving the track silent for now. 9 min: Webber, Schumacher and Rosberg are the only three drivers yet to come out this morning. 9 min: Force India report "a loss of hydraulic pressure" for Sutil's car. 11 min: The track temperature is almost half of what we saw during practice yesterday afternoon so the balance of the cars is likely to be different until things warm up with the incoming sunshine. 11 min: The drivers without early problems are patiently waiting for the telemetry engineers to finish studying the installation lap data, so that they can be given the all-clear for a run on the circuit. 12 min: Mike Gascoyne reports that Kovalainen's gearbox glitch is under control: "Heikki had a sensor problem in the gearbox but fixed now so no problem"
13 min: Lucas di Grassi breaks the silence as he heads out in his Virgin. 14 min: It is likely that the Mercedes drivers won't partake in an install this morning. 14 min: Over the last couple of grand prix weekends, Schumacher and Rosberg have waited out the early minutes and subsequently come straight out for a run of laps. 14 min: Di Grassi crosses the line to begin a lap against the clock. 14 min: Karun Chandhok joins Di Grassi on the circuit for his first run of the day. 15 min: Jaime Alguersuari heads out in the Toro Rosso, making it four drivers now on track. 16 min: Di Grassi's first effort sets the time to beat at a 1m33.802s. 16 min: Mark Webber leaves the Red Bull garage to join the group. 16 min: But Webber is immediately in trouble! He is touring very, very slowly on the circuit. 18 min: Webber is receiving advice on the team radio from his engineer Ciaron Pilbeam. Mark is told that there is no throttle response. 19 min: He is advised to return to the pits at 'idle' and is slowly achieving that task. Once again the reliability devil strikes Red Bull. 19 min: Meantime, Alguersuari is heading the list on a 1m29.700s ahead of Di Grassi. 20 min: Yellow flags remain out at different parts of the circuit as Webber continues a lap even slower than Chandhok managed in yesterday morning's practice session. 21 min: Buemi joins Toro Rosso team-mate Alguersuari at the top of the standings, as Webber slowly heads back to the pits. 21 min: Glock and Di Grassi are currently third and fourth for Virgin with a rush of laptimes about to come in. 22 min: Sebastian Vettel is running quickly on the circuit and moves into second place behind Buemi, as Webber enters the pitlane. 22 min: Sebastien Buemi runs wide at Turn 8 but manages to continue without any signs of damage to the Toro Rosso. 22 min: Robert Kubica is the next man to top the order with a 1m29.482s in the Renault. 23 min: Webber is back in the pits and reaches the Red Bull garage, where major work will no doubt ensue over the next few minutes. 23 min: Hard tyres are of course the rubber of choice at this stage, with a stint on the softer option to come later in the session. 23 min: Vettel beats Kubica's mark with 1m28.011s, with Alguersuari third and Buemi fourth after 23 minutes. 24 min: Mercedes drivers Schumacher and Rosberg are now out on the circuit for the first time today. 24 min: Massa slots in third quickest in his Ferrari, around a second off Vettel's early pace. 24 min: Rosberg immediately goes second to Vettel with a lap of 1m28.851s and Schumacher is about to complete his first timed lap. 25 min: The McLaren pair are now out for the first time with Hamilton going in second quickest. 25 min: Schumacher now takes over second spot behind Vettel with a lap of 1m28.295s. 25 min: Meanwhile, Fernando Alonso clocks a 1m27.866s to top the times in his Ferrari. 26 min: The order is changing rapidly at the top. Alonso now leads the field from Vettel, Hamilton, Schumacher and Rosberg. 26 min: Vettel retakes the top placing with a time of 1m27.482s as he continues on his first run in the Red Bull. 26 min: Vettel shaves almost four tenths off his best to make the benchmark a 1m27.482s, with Hamilton moving up to second quickest in the McLaren. 27 min: Jenson Button is fifth quickest after his first few laps of the morning. 27 min: Rosberg's first run was extremely short - just one timed lap there for the German. His team-mate Schumacher is still out with four laps on the board so far. 28 min: Adrian Sutil is still in the pits as Force India chases the problem that saw him free-wheeling back to base. 29 min: Hamilton has spun the McLaren wildly at Turn 8 and is stuck in the gravel on the outside. 30 min: Hamilton ran wide on the kerb, lost control of the McLaren and couldn't prevent it slewing off into the gravel. 30 min: Schumacher pitted at the end of a five lap run. Many of the drivers have pitted in response to the yellow flags out for Hamilton's incident. 30 min: Hamilton has however made it out of the gravel and is now touring back to the pits with several flat tyres. 31 min: The McLaren is the next car to cause yellow flags in the final sector as Hamilton tours extremely slowly back to the garage. 31 min: What a session this is turning out to be with Sutil, Webber and Hamilton all running into serious trouble. We have just 28 minutes left. 32 min: Only Senna, Liuzzi and Button are out on the circuit along with the ailing Hamilton. 33 min: Karun Chandhok leaves the HRT garage to join team-mate Senna on the circuit. 33 min: Hamilton's set of hard tyres are totally destroyed but he will be able to resume on another set of rubber after the car is cleaned-up. 33 min: Jaime Alguersuari also comes out for another run, now that the track is clear. 35 min: The problem is fixed down at Red Bull and Mark Webber leaves the garage. He has yet to set a time in this session. 36 min: Rosberg and Buemi are also out on track for their second run of laps this morning. 36 min: Both Lotus drivers are back on track with their earlier problems - gearbox sensor for Kovalainen and steering rack for Trulli - now fixed. 37 min: Chandhok sets his best lap so far, moving up to 20th position, as Webber crosses the line to start his first timed lap. 37 min: The Red Bull is finally running at full speed and Webber is ready to play catch-up. The target time is currently 1m27.482s set by Vettel. 38 min: Webber completes that lap and posts 1m29.376s to go 14th fastest. 39 min: Vettel leads the pack with that 1m27s lap so far, with Hamilton second, Alonso third, Schumacher back out and in fourth, with Button fifth. 40 min: Petrov is ninth quickest in his Renault with his best time a 1m28.700. 40 min: Webber moves up from 14th to seventh on his second timed lap with 1m28.334s. 41 min: The one man missing out on all the fun is Sutil. His Force India is still sidelined in the pits, and just 19 minutes left in the session. 42 min: We can now see inside the Force India garage, where Sutil's car is still up on stands with no activity going on around it. 42 min: Most of the drivers are completing second runs of the same set of harder tyres with plenty of fuel onboard, meaning little in the way of improving laptimes for now. 43 min: Sutil will take no further part in the session, and will be under pressure in the first part of qualifying this afternoon. 43 min: Mark Webber has continued his steady rise up the rankings. He is now second to team-mate Vettel with a lap of 1m27.807s. 45 min: Webber posts another 1m27.8s on the following lap as he continues on his first run of the day. 45 min: Work continues in the McLaren garage to clean-up and repair Hamilton's car after that major spin at Turn 8 earlier in the session. 45 min: Red Bull may be dodging bullets but continue to head the Formula 1 field. 46 min: Webber finds further time on his next lap - 1m27.553s puts him just 0.071s down on his team-mate. 48 min: The hard tyre runs are now drawing to a close, with a late blast on soft tyres coming up for the drivers in the final 10 minutes. 49 min: Sebastien Buemi is in the garage, talking about his second run on the team radio. 49 min: He says that he is losing grip from the front tyres in the slow speed parts of the circuit after just a couple of laps, as the inevitable tyre graining phase comes in. 49 min: Timo Glock has the softer rubber on his Virgin and clocks a 1m31.378s, which is his best of the morning but keeps him behind the Lotus pair. 50 min: Meantime, Buemi's team-mate Alguersuari is one of the first to try out the softer rubber today. The Spaniard is on a timed lap right now. 50 min: Alonso is on track with the softer tyres on his Ferrari. 51 min: Alguersuari moves up from 13th to 11th with a lap of 1m28.734s. 53 min: Buemi is back out for his final run. He hopes he can better better grip from what is likely to be his soft tyre run. He is currently 13th. 53 min: Alonso survives a minor moment in Turn 4 followed by a more serious wobble at the Turn 9/10 chicane and unsurprisingly the time is slower than his earlier best. 54 min: Hamilton is back out in the repaired McLaren with soft tyres now fitted. 55 min: Buemi moves up the list from 13th to tenth with a lap of 1m28.610s, as Webber comes out for his final run of the morning. 55 min: Alonso improves by a fraction on his second tour while Hamilton tops the order in 1m27.396s on his soft tyre flyer. 56 min: So it's now Hamilton at the top, from Vettel, Webber, Alonso, Schumacher and Button with under four minutes remaining. 56 min: The drivers are struggling for a clean lap with the one shot on soft tyres. Massa's first attempt was slow after finding traffic. 57 min: Mark Webber ruins his soft tyre effort with a wild run wide at Turn 1. His car is undamaged and he backs right off to try and keep some life in this set of tyres. 57 min: Massa remains eighth and he can't find time on his second lap with the tyres already past their best. 58 min: Robert Kubica does make a good move forward, putting the Renault up to fourth quickest. 58 min: Karun Chandhok has made a mistake a Turn 8, losing some eight seconds in the process. He continues. 58 min: Hamilton set his personal best first sector but was slowed by clearing Senna's HRT. 59 min: Webber is off the road again, this time at Turn 4 and onto the asphalt run-off area. He continues. 59 min: It's all happening for the Red Bull drivers! Now Vettel takes a scenic trip round Turn 8 as he bids to retake the top spot from Hamilton. 60 min: Vettel continued on the extra asphalt run-off without any damage. 09:00 This is unbelievable stuff. Now Webber is off for the third time in as many minutes with a wild spin. He rejoins the circuit. 09:00 The flag is out as drivers continue to struggle for grip in the late scramble. 09:01 Vettel is under the target time on his final lap but has traffic. Can he do it ...? 09:02 Yes he can. Vettel takes over at the front from Hamilton with a late, late 1m27.086s. 09:02 Drivers are again touring around to practice starts from the grid. 09:03 Rosberg improves to second with his final lap - 1m27.359s, demoting Hamilton down to third at the very end. 09:04 So after an eventful session to say the least, it's Sebastian Vettel at the top with 1m27.086s, with Nico Rosberg second and Hamilton third. 09:05 Mark Webber ended up fourth, ahead of Kubica fifth, Alonso sixth and Schumacher in seventh spot. 09:06 Pedro de la Rosa is the last man back in the pits to wrap up practice in Turkey. 09:06 Jenson Button lost out in that late flurry, finishing up in eighth. Massa was ninth and Vitaly Petrov rounds out the top ten. 09:11 Well it's all happened this morning - what a session. 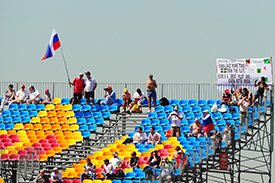 Kovalainen, Sutil and Webber all hit trouble on their opening lap of day, requiring attention in the pits. Hamilton then spun wildly into the gravel at Turn 8, and once Webber's Red Bull was fixed both he and team-mate Vettel were all over the shop as they pushed the limits. But Red Bull somehow come out of a difficult weekend still on top. But one more slip in qualifying really could let the opposition in. Will Webber and Vettel keep it together, or succumb to further problems? Join us for qualifying at 10:45 GMT.